Just one this month – 23rd June we’re at Walnut Tree Shades in Norwich. Sadly without Trev, so we’ll be doing a toned-down, sort-of unplugged set for a change. Then on the 1st of July we’ll be back at the St Ives Festival Of Motorcycles for the 4th year in a row. 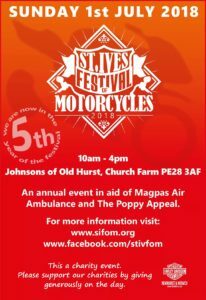 A super event that’s grown and grown, so much so that the town of St Ives (in Cambridgeshire, not the other one) is too small so it’s just outside the town. Loads of bikes, bands and attractions. Go to their website for more information.